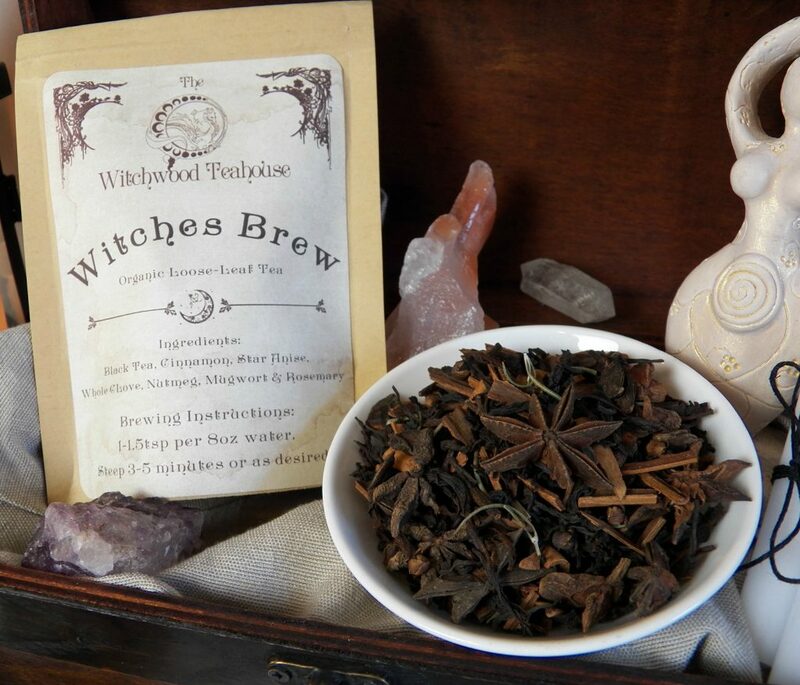 Used in brews to calm nerves and induce sleep. It is also used to attract money, and help combat curses. 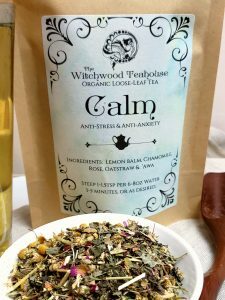 Drink Chamomile tea during a ritual to help heighten your focused energy related to prosperity, soothing tempers, sleep, and breaking curses. Burn Chamomile flowers as an incense to promote prosperity. 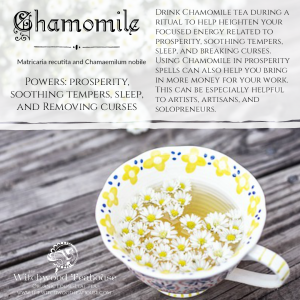 You can use Chamomile in prosperity spells to help you bring in more money for the work you perform. This can be especially helpful to artists, artisans, and solopreneurs. Drink a cup of Chamomile tea daily for its healing and relaxing properties. 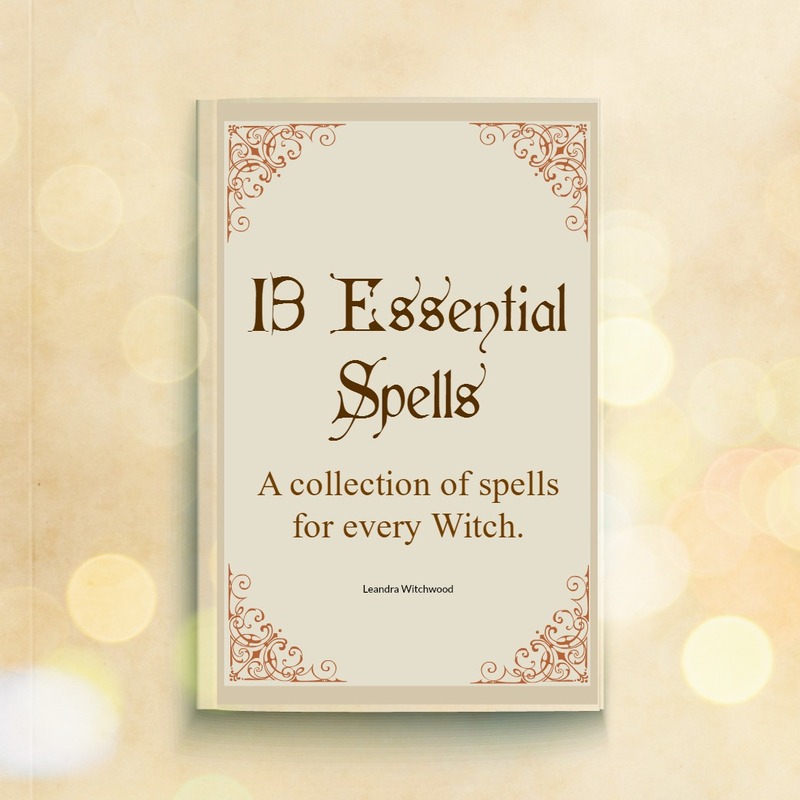 In spells drink tea blends infused with Chamomile or burn the flowers for wealth and prosperity. 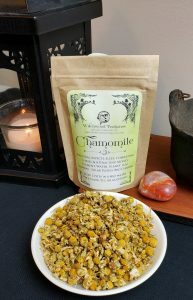 Chamomile can be helpful when used in dream work and in banishing negativity. It works well alone but often works best when combined with other beneficial herbs and spices. Chamomile tea has long been enjoyed as tea, which is no wonder as this unique plant comes with a variety of health benefits. Chamomile tea as a caffeine-free beverage. It is known for its somewhat sweet flavor with an earthy undertone. Chamomile is a plant that comes from the Asteraceae family. The Asteraceae family is a very large and widespread flowering plant family which includes sunflowers, chicory, aster, and other types of daisies. To make chamomile tea, 1-1.5 teaspoons of chamomile flowers in 6-8oz of boiling water for 3-5 minutes or as long as you desire. Chamomile tea regularly may play a role in lowering your risk of several diseases, including heart disease and cancer. 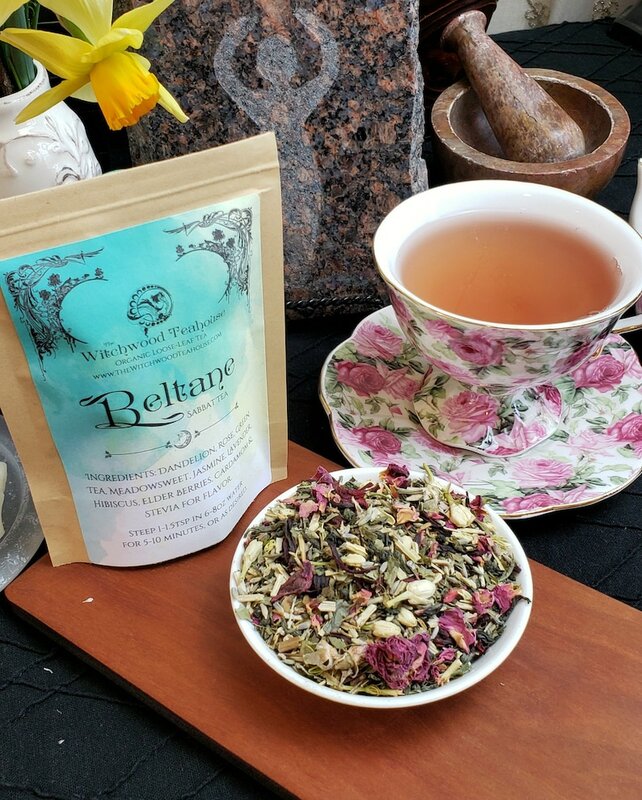 This herbal infusion is loaded with nutrients including antioxidants that help improve your health in many ways, including digestion. Although, Chamomile is probably best known for its properties related to sleep. Chamomile is a sedative and relaxant. These valuable attributes help relax muscle tension, ease stress, and anxiety. This powerful plant, especially when combined with other plants with similar attributes can help you feel more relaxed in environments and situations that might otherwise make you tense. It is no secret that prolonged exposure to stress can have long-term negative effects on your overall health. Easing stress and tension is important to proper self-care and longevity. Proper digestion is important for your overall health and well-being. Due to its anti-inflammatory effects, chamomile may protect against many digestive issues like diarrhea, stomach ulcers, nausea, and gas. 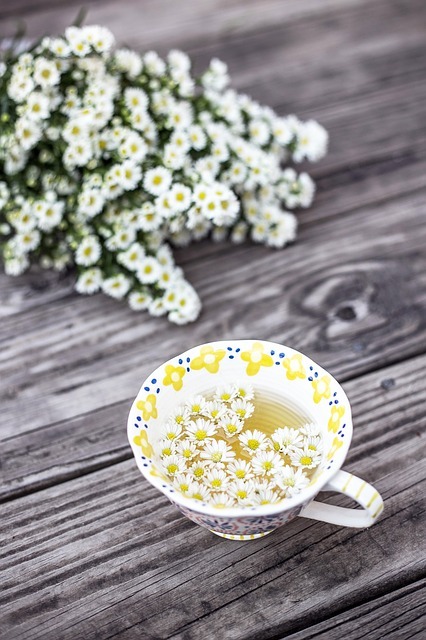 Studies have found that chamomile may reduce acidity in the stomach and inhibit the growth of bacteria found to contribute to the development of ulcers. 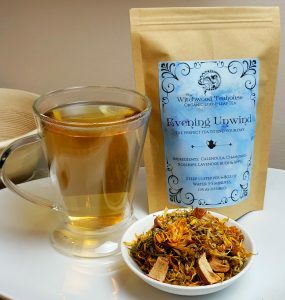 Chamomile is probably best known for its benefits related to asleep. 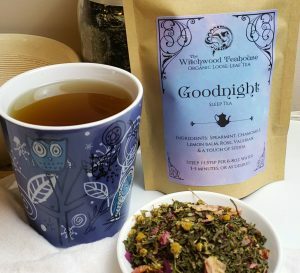 Studies show that chamomile has many unique properties that may improve your quality of sleep as well as help you fall asleep faster. Chamomile contains an antioxidant called apigenin that binds to certain receptors in your brain. This unique fusion may promote sleepiness and reduce insomnia, in most people. Let’s talk flavones. Chamomile tea is abundant in a class of antioxidants called flavones. Flavones have the potential to lower blood pressure and cholesterol levels, which are important markers of heart disease. In one study, patients who drank chamomile tea with meals had significant improvements in their total cholesterol levels, compared to those who only consumed water. The antioxidants found in chamomile tea have been linked with a lower occurrence of certain types of cancer. The antioxidant apigenin found in chamomile, may help lower inflammation and reduce the risk of several types of cancer. It has been observed that those who drank chamomile tea (2–6 times per week) were significantly less likely to develop thyroid cancer compared to those who did not drink chamomile tea. It is believed that the anti-inflammatory effects of chamomile tea may promote blood sugar control, especially when consumed with a meal. The health of your pancreas is important to your overall health. This is where insulin is produced. Insulin is the hormone responsible for removing sugar from your blood. Chamomile’s anti-inflammatory properties may prevent damage to the cells of your pancreas, which occurs when your blood sugar is chronically elevated. Chamomile tea is a healthy beverage. The research related to the benefits of chamomile tea is hopeful. It is rich in many powerful antioxidants that have a variety of health benefits, including reducing the risk of cancer and heart disease. Chamomile is very safe to consume, and many people enjoy drinking it for its delicious taste and floral aroma. Chamomile, as with all herb, works best when blended with other herbs that compliment chamomile’s medicinal and magkical properties. Find a blend that tastes great and works well for your needs. Although herbs have been consumed for thousands of years with positive results and health benefits, we must provide you with this disclaimer. Our products & statements have not been evaluated by the FDA. The claims in this post are not intended to serve as medical advice to prevent, treat, or cure any disease. Please consult your doctor before taking any herbs if you are pregnant, nursing, or have a medical condition. Humans are complex therefore results may vary depending on consumption and individual physiology. Please be advised that you are on a site that promotes the use of and sells homeopathic & herbal supplement suppliments that have NOT be evaluated by the FDA.